Two years ago, one of the most controversial figures of the age of cyberspace appeared on the doorstep of the Ecuadorian Embassy in London. On the verge of losing an appeal in the British courts that could open the door to his extradition to Sweden and then later, the United States, where a secret Grand Jury had convened to indict him, Julian Assange sought refuge in Ecuador’s modest Embassy flat. During the following two months, the Ecuadorian government studiously reviewed his case, calling in experts to discuss and debate the duties and risks Ecuador faced in granting the asylum petition. On August 16, 2012, Ecuador’s Foreign Minister, Ricardo Patiño, announced that his country would grant Assange diplomatic asylum, a concept enshrined in the Convention on Diplomatic Asylum of 1954, also known as the Convention of Caracas. The British government refused to recognize this status and initially threatened to violate Ecuador’s sovereignty by entering into the Embassy and arresting Assange. After strong protest from the Ecuadorian government and outcry from Latin American nations, England refrained from causing an international uproar by forcing entry into the Embassy, and instead chose to maintain a prominent police presence surrounding the building, impeding Assange’s escape. Two years later, the Assange case is at a standstill. Despite his legal team’s efforts to end the unsubstantiated persecution against him from Sweden, where no formal charges have materialized, an extradition request still remains to bring him to Stockholm for “questioning”. The British government has made clear it would extradite Assange to Sweden if they could detain him. While no public extradition request has been issued from the United States to Sweden for Assange, sufficient evidence exists to demonstrate that a Grand Jury may have already indicted him in a US court, on charges, including espionage and/or aiding and abetting the enemy, that could result in his long-term imprisonment were he subjected to a trial. This well-founded fear of political persecution has reinforced Ecuador’s decision to maintain his political asylum. 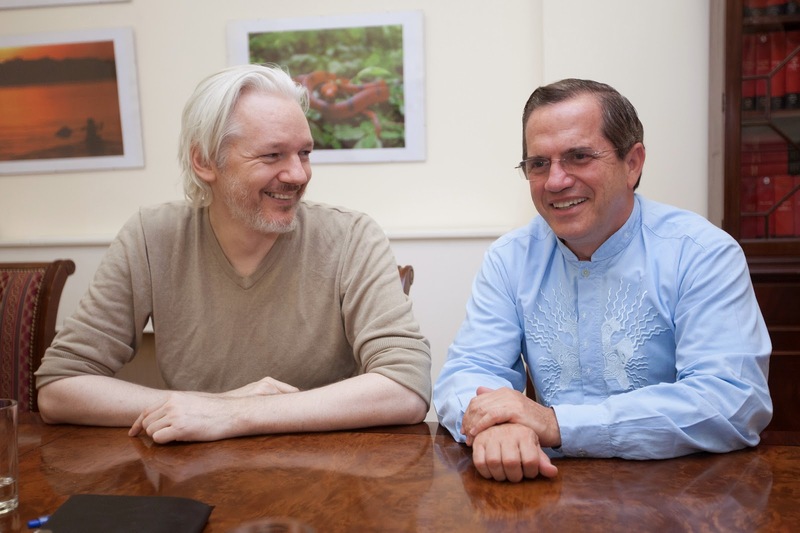 In 2013, when Foreign Minister Patiño visited Assange in the Embassy on the one-year anniversary of his confinement, Ecuador initiated an effort to create a bilateral working group with the British government to find a solution to the situation. To date, no movement has been made in the group and England has refused to discuss the matter further. Recently, during Foreign Minister Patiño’s second visit to see Assange on August 16, 2014, the British Foreign Office issued a statement claiming they were “committed to finding solution”, yet only according to their vision of the outcome: "We remain as committed as ever to reaching a diplomatic solution to this situation. We are clear that our laws must be followed and Mr Assange should be extradited to Sweden. As ever we look to Ecuador to help bring this difficult, and costly, residence to an end." In other words, the British government sees no other solution than Assange’s extradition. Their unwavering, rigid position leaves no opportunity for diplomacy or creative problem-solving, which is what this case needs. The Ecuadorian government has reiterated its support for Assange and has made clear that their country is bound by international law to maintain his asylum. As Minister Patiño has affirmed, there is no return policy on asylees who are still subjected to exactly the same conditions as when the asylum was granted. The persecution remains, and there are still no charges of any kind against Assange. Ecuador, a small nation of 15 million inhabitants with bananas and beautiful roses as its main exports, has remained defiant in the face of pressure from England, Sweden and their biggest ally, the United States. Two years enclosed in the Ecuadorian Embassy, a narrow flat with just a handful of rooms, has taken its toll on Julian Assange. While he continues to work from his small space inside the Embassy, and his organization Wikileaks has not ceased publishing important documents exposing the abuses and illegal acts of powerful interests, the lack of sunlight, fresh air and regular exercise have obviously decreased his quality of life and impacted his health. Despite his confinement and separation from close friends and family, his spirits remain high, as was apparent during the visit with Minister Patiño, and he is optimistic about changes to a law in the UK that potentially could lead to his freedom. Known within political circles as the “Assange Act”, an amendment was made in early 2014 to the Extradition Act 2003 in the British parliament. Resulting from discontent and discomfort over the legal limbo Julian has been in for the past four years – even two years before receiving asylum from Ecuador, Assange had been on house arrest in England, pending potential extradition to Sweden - several British MPs began debating a substantive change to the law that would impede a future Assange situation from happening to someone else. The amendment is included in the Anti-social Behaviour, Crime and Policing Act 2014 (not the most socially-friendly name), in Chapter 12, Part 12. It specifically states that “Extradition is barred if no prosecution decision has been made in the requesting territory”, as in Assange’s situation. If the country requesting extradition has not yet charged or decided to try the individual being requested, than the United Kingdom will not extradite. This is exactly the case of Julian Assange. The Swedish prosecution has not decided to try him yet or even formally charge him, and the extradition request is merely based on the desire to “question” him about certain allegations he may or may not be involved in. Julian’s legal team will need to challenge this law in order for it to be applied to his case, since at present it does not appear to be retroactive. But there is no denying that this change in the law would impede Assange from being extradited to Sweden were it to have been in place previously. Ecuador’s Foreign Minister made reference to the amended law as a potential opening for dialogue with the UK government in the case. Ecuador has also offered to allow Swedish authorities question Assange inside the Embassy, or via videoconference, all to no avail. It seems as though the only parties interested in finding a solution to this situation are the government of Ecuador and Julian Assange. The Brits and the Swedes have done everything possible to stall and stonewall the case. Foreign Minister Patiño has stated previously that Ecuador could bring the case before the International Court of Justice in the Hague, or the United Nations. The affronts to Ecuador’s sovereignty, the failure to recognize the asylum granted to Julian Assange and the refusal to provide him with safe passage to Ecuadorian territory are all violations of international law. Julian’s human rights are also affected. The inability to fully enjoy his right to asylum and the confining conditions he has been forced to remain in for two years, under threat by arrest by British authorities right outside the Embassy doors and windows, have subjected him to cruel and inhumane punishment. Were he to experience a medical emergency and need hospital attention, the British government has already made clear it would arrest him. Both Julian Assange and Ecuador have taken on the most powerful world interests, despite the dangers, threats and consequences of their actions. Foreign Minister Ricardo Patiño and President Rafael Correa have made clear that Ecuador will stand strong in its decision to grant Assange asylum under international law, and they will not bow to pressure and intimidation from anyone. The Assange case goes beyond just simple political asylum and issues of sovereignty. It is matter of principle in a time in which information and secrecy have become ever more the tools of the most powerful. Justice must be done for those who have sacrified their liberties to warn us of these dangers.